Jerald Gillens-Butler dribbles down the court. Butler kicked off the 2018-19 with a 22-point win over Miami (OH). Photo by Jimmy Lafakis. 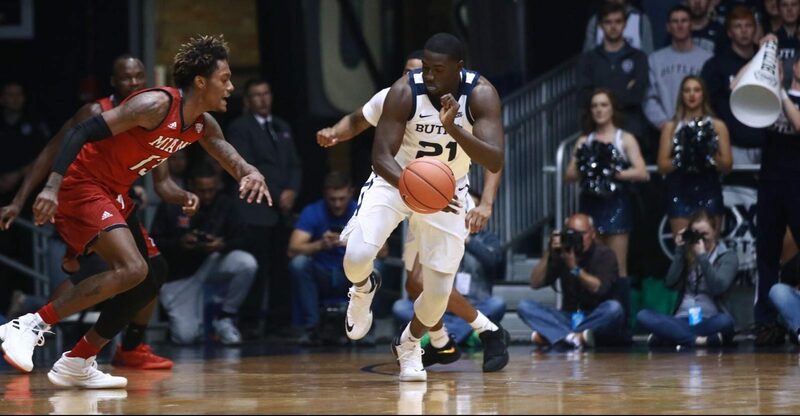 Saturday’s game between Butler and the Miami RedHawks was the regular season opener for both teams and a part of Family Weekend on Butler’s campus. Hinkle Fieldhouse was ready for the action. The story of the night was Joey Brunk scoring a career-high 17 points off a perfect 7/7 shooting. He had Twitter raving. And even some BOLD predictions, too. Butler fans were not just excited to see Brunk play well, though. Aaron Thompson saw his offseason work on his jumpshot pay dividends. Even Bulldogs who didn’t suit up for the game were receiving praise. Jordan Tucker is drippin’. Again, I think I’m using that correctly. However, a good night was not had by all. In a surprising turn of events, sophomore breakout candidate Christian David saw just three minutes of action in the 22-point win. I wonder where Christian David is going to transfer to? While not trying to overreact to the first game of the season, this was a quality win for the Bulldogs against a solid mid-major opponent. The Bulldogs have a short turnaround as they welcome former Horizon League foe Detroit Mercy on Monday.